Basin Street was the road which led up to the canal basin (a turning area for the canal boats at the time) in New Orleans. It became notorious as a red light district in the district of Storyville during the latter years of the 19th century and early part of the 20th century. 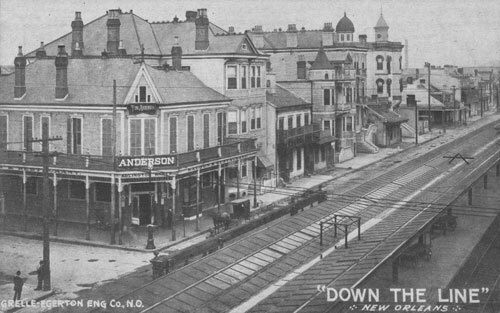 By the time Basin Street Blues was written by Spencer Williams and first performed by Louis Armstrong the place had been cleaned up. However some of the song lyrics "Basin Street is the place where the dark and the light folks meet.." refers to the mingling of whites with African Americans and Creoles amongst the brothels and clubs where a lot of jazz music of the day could be heard.